Available to current, valid 2016/2017 Collector Club members in good standing for a limited time only while supplies last. Exclusive access ends 11:59pm EST, 12/8/16, while supplies last. Grab bags remaining after 11:59pm EST 12/8/16 may be offered for sale by Reeves to non club members/general consumers, at Reeves’ sole discretion. Each bag has a retail value of at least $219! Three blind bags are available containing six items each and are a mix of product from any category and include some special editions! There may be repeats of an item in the three bags depending on what inventory is available. Contents may vary within each grab bag. Limit one (1) each Bag Per Order. For me, the 2016 Collector’s Club Grab Bags are an easy pass. Sure they’re fun to open and it’s always exciting hearing what is in each bag type when they start arriving in collector’s hands. I know that some won’t be able to resist the fun side of Grab Bags and I will live vicariously through them, hehe. 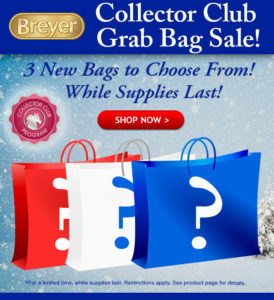 Will you be purchasing any of the Breyer 2016 Collector’s Club Grab Bags? If so, which one(s)?